It's almost seemed like they were hamming it for the camera. I was shooting from the front porch, about 1/4 of a mile away. Obviously that is Windy doing all the galloping! We always said if she had the heart for it, she could outrun her mama, Ginger, who is doing all the bucking. Even Blue throws in a little crowhop there! If I could never ride again, I would spend my days just watching them. Then Ritz runs down to see if he can join in the fun. He is so intuitive to what I am doing. If I get my boots and go to the tack room, he knows I'm wanting the horses and will head down to the pasture. More recently, he has figured it's Windy whom I usually get and will single her out. This time, I think he must have been watching me watch them & wasn't quite sure what to do, so he went to investigate. It's Maddie you hear whining in the background. I don't know if she was whining because I was on the porch or if she was just watching Ritz. In her old age, she whines a lot. 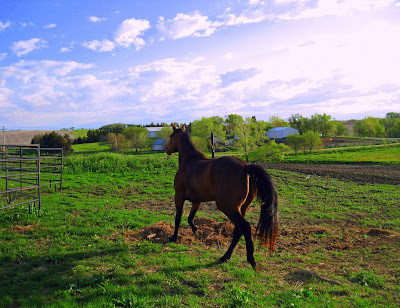 Ritz caught the attention of the horses as he was making his way through the alfalfa field. I didn't know what they were looking at at the time; I was trying to stay steady with the camera. Once Ritz made it down there, much to his disappointment, the horses stopped their play. Ritz is definitely my buddy, my keeper. He's laying on the porch right outside my office window right now. If I get up to go into the kitchen, he'll be at the patio doors on that side of the house almost before I can get there. He's my good guard dog. I love all your green grass :) I hear ya, I could just sit and watch them all day long. Love to see horses being happy and showing off. There isn't a better view from a front porch, in my opinion. Windy looks lovely! LOL, it's always fun to watch horses buck, as long as you're not on them, right? Ginger does look like my friends Mustang Cazi, in coloring! I love how Windy scouts firsty with your dog..then Ginger decided to give alittle chase, that was never to be.